On Sunday, February 11, 2018, His Grace, our Bishop, Irinej served the Hierarchical Divine Liturgy with the St. Luke Serbian Orthodox Church community of Washington D.C. along with host parish priest Rev. Dr. Vasilije Vranic. His Grace was in Washington D.C. to attend the St. Luke Serbian Orthodox Church Annual Fundraiser two days prior. As His Grace arrived to celebrate the Liturgy, he was greeted by the children of the St. Luke parish, comprising members of the Sunday School, Serbian School, and Folklore programs. The children presented His Grace with a bouquet of flowers. 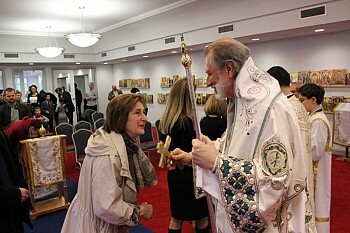 In addition to His Grace, other honored guests serving the Divine Liturgy included V. Rev. Stavrofor Aleksandar Sredojevic, retired parish priest of the St. Sava Cathedral of Vracar in Belgrade, Protodeacon Milos Zdralic, Diocesan Financial Secretary, and Deacon Dr. Jovan Anicic, Diocesan Christian Education Director. During the Divine Liturgy, His Grace spoke movingly about the Gospel lesson of the Last Judgment – the appointed Gospel Lesson of the day. After addressing the adults, His Grace affectionately, and interactively, spoke to the children present about the same Gospel lesson. The children were attentive as “Deda Vladika” spoke to them and greatly enjoyed hearing from their Bishop. At the end of the Divine Liturgy, His Grace elevated parish priest Fr. Vasilije Vranic to the rank of Protonamesnik, or Economos. At the elevation, the congregation joyously exclaimed Axios! in honor of their new parish priest. After Liturgy, all were invited to a luncheon prepared by the St. Luke Circle of Serbian Sisters. The Children’s Choir, under the direction of Popadija Jelena Vranic, gave a small performance for His Grace, as did the St. Luke Folklore Group, under the direction of Radmila Bozic. The entire St. Luke congregation enjoyed their Diocesan Bishop’s visit and look forward to His next visit with our community in our nation’s Capital.